5 November 1942 and Private S. Collins enjoys a moment of fame [picture] /Part of the Hurley negative collection. ; Condition: silvering. ; See Hurley at War, 1986, p. 156. Negative is a reshot from a print. "The cigar clamped between his teeth was given to him by British Prime Minister Winston Curchill on a tour of the Western Desert after the Germans were crushed at El Alamein. 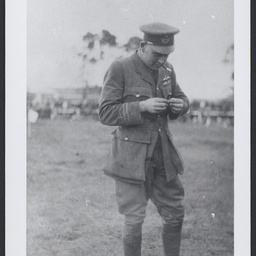 Private Collins never smoked the cigar. He told the press that he planned to keep it in a glass case as a family heirloom". ; Hurley series: World War II. Army officerA uniformed army officer identified as Major Gordon. 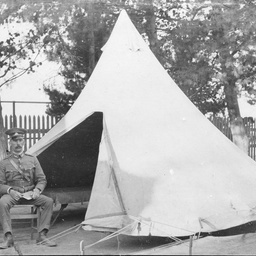 Army officer Captain Kinnish.Army officer Captain W. Kinnish sitting at the entrance to a tent. Arthur Dodd and Celly McHughFormal portraits of A.I.F. 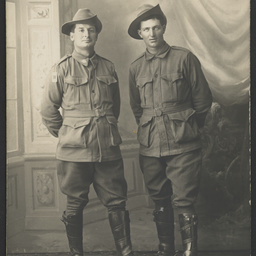 soldiers, Arthur Dodd of Millicent, S.A. and Celly McHugh(?) 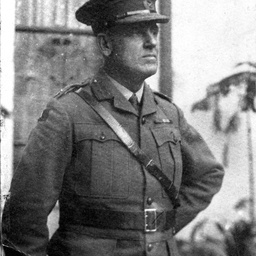 of Quorn, S.A.
Brigadier General Antill.Close view of Brigadier General Antill, Commandant of the South Australian Forces 1918-21. 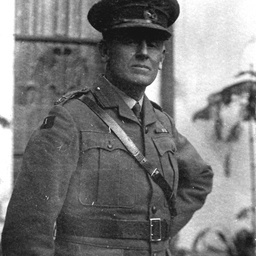 Brigadier General Antill.Brigadier General Antill, the Commandant of South Australian forces, 1918-1921. 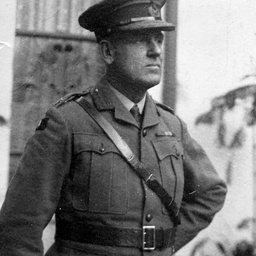 Brigadier General John Antill.Close view of Brigadier General John Antill, Commandant of South Australian forces 1918-1921. 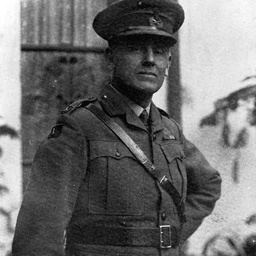 [Brigadier General, Sir Carl Jess] Spencer Shier. 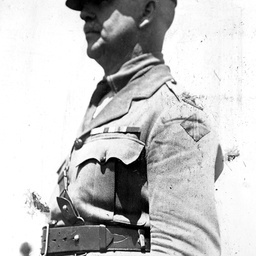 Spencer Shier.Whole-length, full face, wearing military uniform. 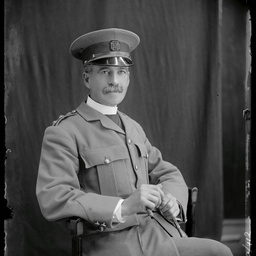 Brigadier-General Antill.Brigadier-General John Antill, Commandant of the Commonwealth Military Forces in South Australia. 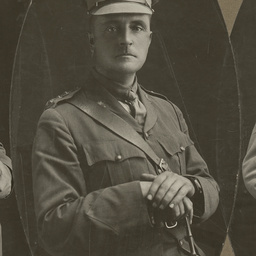 Brigadier-General J.M.Antill.Brigadier-General John Antill, Commandant of military forces, South Australia in 1918 after distinguished service with the A.I.F. 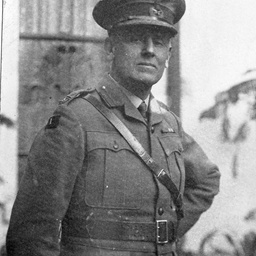 Brigadier-General John Antill.Brigadier-General John Antill, Commandant of South Australian Forces, 1918-1921. 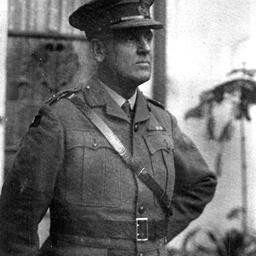 Brigadier-General John Antill.Brigadier-General John Antill, Commandant of the Australian Military Forces in South Australia. C. .H. 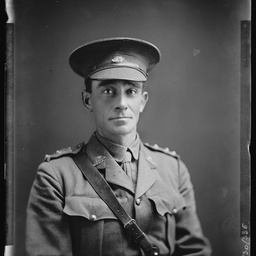 HannafordPORTRAIT: C. H. Hannaford, a South Australian author, wearing army uniform. [C.N. Champ]Whole-length, full face, standing in army uniform. Sapper, 9th Rifles, New Zealand Engineers. 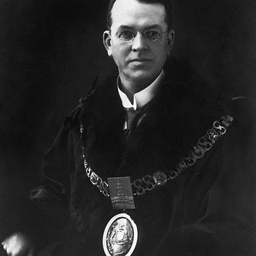 Item is held by John Oxley Library, State Library of Queensland. 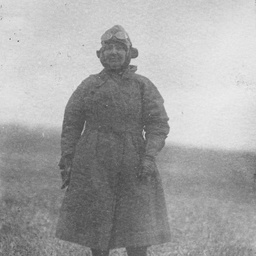 Captain A.W. 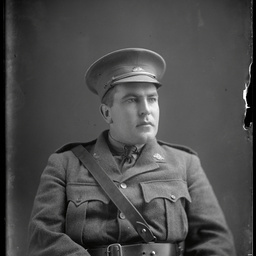 Macarthur Onslow. 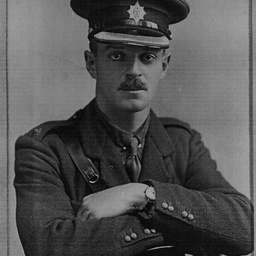 CamdenKilled in action Ypres in World War I on 7/11/1914. 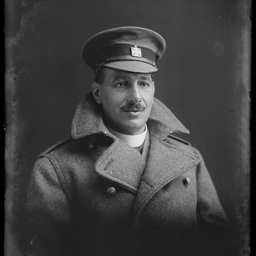 Captain Chaplain FlemingCaptain Chaplain Fleming. Captain Harry ButlerCaptain Harry Butler. 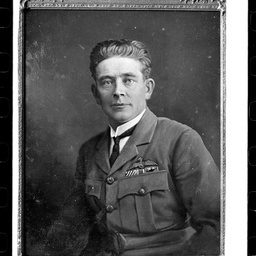 Captain Harry Butler.Captain Harry Butler, the South Australian aviator, photographed wearing his flying uniform. 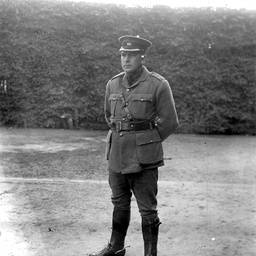 Captain Harry ButlerCaptain Harry Butler, 23 August 1919 on Unley Oval. 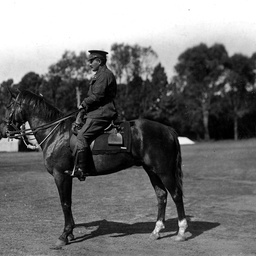 Captain J.K. PaulArmy officer, Captain J. K. Paul, on horseback. 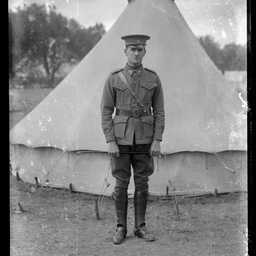 Captain John Martin HawkeyPre-embarkation leave in Sydney, May 1916, World War I.
Captain McKenzie.Captain McKenzie, an army Provost Marshall attending a military camp. Captain Robert Falcon Scott, RN, CVO, FRGS [picture]"In the service of his country he sacrificed his life in a perilous and arduous expedition on behalf of science and discovery, March, 1912. "; Exhibited: "Antarctic Heroes", National Maritime Museum, 5 Dec 02 - 4 May 03; U8004 NK3336. 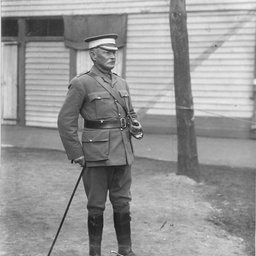 Captain S.A. Nottingham, decorated with the Volunteers Long Service Medal, 23rd May, 1913Captain Nottingham was recognized for serving thirty years with the Volunteer Defence Forces. Information taken from the back of the photograph. Captain TM StuartCaptain JRTE Borrow. Captain TM StuartCaptain TM Stuart, comp. Quartermaster. Carl Mann"Caption: ""To dear old Captain (W Spencer) with the best of love from his old pal, Carl, 20-5-1916"
Charles "Moth" EatonFlight Lieutenant Charles Eaton, Prisoner Of War camp, Germany. Charles Richmond John Glover.PORTRAIT: Charles Richmond John Glover, first Lord Mayor of Adelaide. 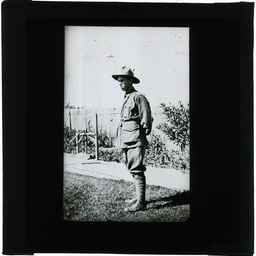 Christopher HallThis is a photograph of Private Christopher Hall, taken c.1917, possibly in Orange, N.S.W. 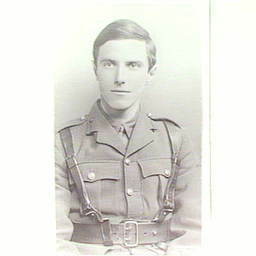 Hall enlisted in 8/36th Battalion in 1917, and was killed at Villers Bretonneux, France on 25 April 1918. His service number was 3313. Christopher HallThis is a studio portrait of Christopher Hall. 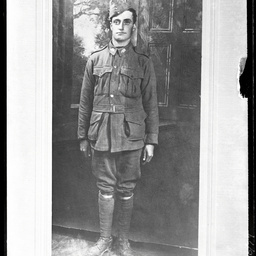 Hall enlisted in the Australian Army in 1917 at Orange, NSW. His family was from the Coonamble and Merriwa districts. 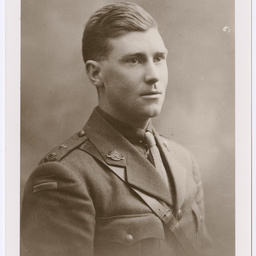 Hall was attached to the 8/36th Battalion, and his service number was 3313. He is buried in the Adelaide Cemetery near Villers Bretonneux, France - close to where he died on 25th April 1918. 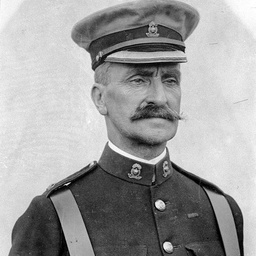 CLIFFORD, Private APrivate A. Clifford was first Club Captain of the South Wollongong Surf Lifesaving Club, 1915. 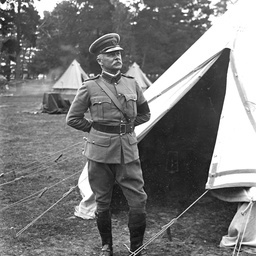 He was killed in action in World War I. 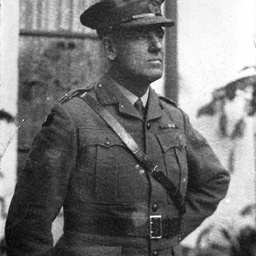 Colonel HancockColonel Hancock, commanding officer of a military camp held on Jubilee Oval, Adelaide, during World War I. 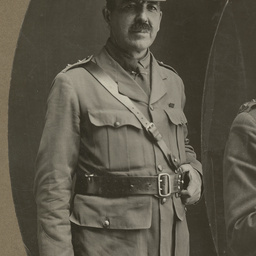 Colonel Hurcombe.A head and shoulders view of the South Australian soldier Colonel Hurcombe. 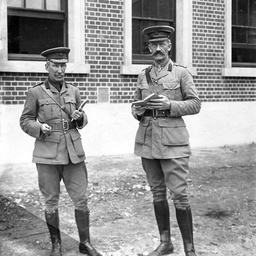 Colonel Irving.Colonel Godfrey Irving, Camp Commandant of South Australia standing right with another officer at Keswick Barracks, South Australia.